tradition. The cuisine is a distinctive feature of Sa Mandra, largely characterized by homemade products on the estate, from pasta to desserts and cheeses. Recommended to couples but also to families who want to experience a stay in the sign of tradition, just small distance from the main sights. Located in the outskirts of Alghero, on the road heading the airport. The farmhouse Sa Mandra has a good starting position to discover either the beautiful beaches and bays in the surrounding or to plunge yourself in the Mediterranean vegetation. The old town of Alghero, also called the "Sardinian Barceloneta", can be reached quickly and it is a wonderful spot to wonder around, enjoy the narrow streets and the breeze of the sea from the top of the fortress that encircles Alghero. The sister farmhouse Su Passu is located approximately 5 km away and offers a wellness area. Surrounded by a garden of myrtle and helichrysum, Sa Mandra is an agriturismo run by the Murrocu family. In the entrance of the farmhouse there is a “pinneto” which stands for a circular paddock where shepherds used to confine sheep for milking. The whole structure can be also defined as an open-air museum full of ancient items and Sardinian farming handicrafts. The agriturismo Sa Mandra has 5 rooms characterized by a warm Sardinian style, that feature hand-carved furniture and are different from each other. All rooms are fully-equipped with air conditioning, TV LCD, safe, minibar and en-suite bathroom with shower. They are about 18 sqm. The nearest beach is just a few km from Sa Mandra, but the beaches and coves in the area of Alghero are so many that you have the chance to explore a new one every day. In the nearby of the Monte Ferro beach, you have the chance to book amazing excursion horseback riding. The “Tre stelle Horse Riding Sa Mandra” organize different itineraries across the sandy coast of Porto Ferro, the maquis Mediterranean and till the Bartz Lake. Gastronomy represents one of the main aspect of Sa Mandra which also offers dedicated menu for vegetarian and celiac. Breakfasts, lunches and dinners are served "al fresco", on the veranda or in a beautiful dining room featuring typical wooden canopies, clear tablecloths, straw-bottomed chairs. The rich menu is based on local and seasonal products, traditional recipes and cooking methods. Special meals for any food intolerance or vegetarians can be organised. The restaurant is open daily during the months July and August for lunch and dinner. While during the other months this service is available only on request and from September onwards, every Monday is closed. The guests are welcomed in the area outside area of Sa Mandra with a tasty aperitif with typical products, many of which are produced directly by the farm Sa Mandra is a small open-air museum, a farm transformed into a small village where you can breathe the air of ancient Sardinia and you will be welcomed as it would do a local family. The company organizes tastings and exhibitions of local products, cultural tours of the "open air museum" and "Su Pinnetu" (the pastor's house), cooking classes and eco-tourism in the area. 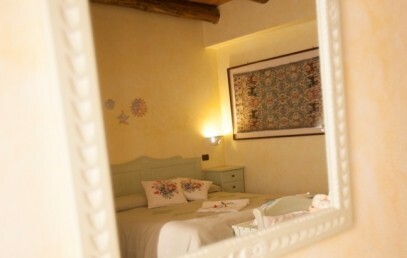 Comfortable double room (3rd bed on request) characterized by a warm Sardinian style, equipped with handmade furniture and fully-equipped with safe, minibar and en-suite bathroom with shower.